Drew gratefully recognizes the loyalty and commitment of alumni, parents, faculty, staff and friends of the University through the following donor recognition societies. Each year the University publishes the Honor Roll of Donors report to celebrate the contributions of the community to Drew’s educational mission. On average, more than 40% of donors to Drew University are members of at least one donor recognition society—some donors are part of all three! In 1870, the McClintock Association began a fundraising campaign at Drew, which raised scholarship support in honor of John McClintock, Drew’s first president. Today the President’s Circle recognizes donors who have made cumulative lifetime gifts of $100,000 or more to the University. The list of donors who belong to the President’s Circle is an honor roll of Drew’s most farsighted and generous alumni, parents, faculty, staff and friends, who, over the years, have provided leadership to Drew’s various fundraising campaigns, establishing scholarships, supporting programs and funding buildings that have enabled the University to provide students with an exceptional education. For more information about Drew’s giving societies, please contact Beth Kornstein, assistant vice president of University Advancement, at ekornstein@drew.edu or 973-408-3227. 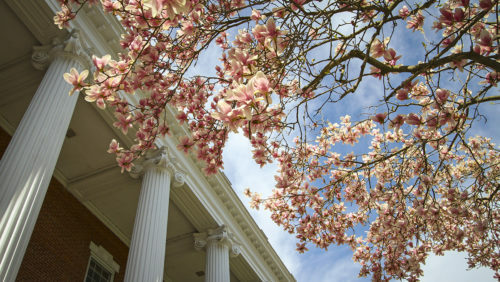 The Acorn Society, previously known as the New Founders Society, recognizes alumni, parents, faculty, staff and friends of the University who have provided for Drew through a bequest or life income gift or who have named Drew as beneficiary of a life insurance policy or retirement account. Similar to an acorn’s ability to seed a mighty oak, these thoughtful planned gifts guide and enhance Drew’s financial development and allow the University to plan with confidence for the future. For more information about the Acorn Society, please contact Beth Kornstein, assistant vice president of University Advancement, at ekornstein@drew.edu or 973-408-3227. Members of the Drew Society are part of a critical and diverse group of dedicated alumni, parents, faculty, staff and friends who support Drew at a leadership level. With giving levels that reflect trees found in The Forest, the Drew Society recognizes members who contribute $1,000 or more annually, including corporate matching gifts. Graduating students become a part of the Drew Society with a gift of $100 or more. Alumni who graduated within the last five years who make gifts of $250 or more annually and alumni who graduated within six to 10 years and give at least $500 annually are also acknowledged as members of the Drew Society. For more information about the Drew Society, please contact Kaitlin Casey, interim director of Annual Giving, at kcasey1@drew.edu or 973-408-3039. The longevity and strength of a forest can be measured by counting the consecutive rings of its member trees, a process known as dendochronology. Drew’s Forest is no exception; here the rings are the dedicated alumni, parents, faculty, staff and friends of the University that sustain its growth year after year. The Dendros Society recognizes consecutive giving by Drew’s most loyal supporters for five or more years. 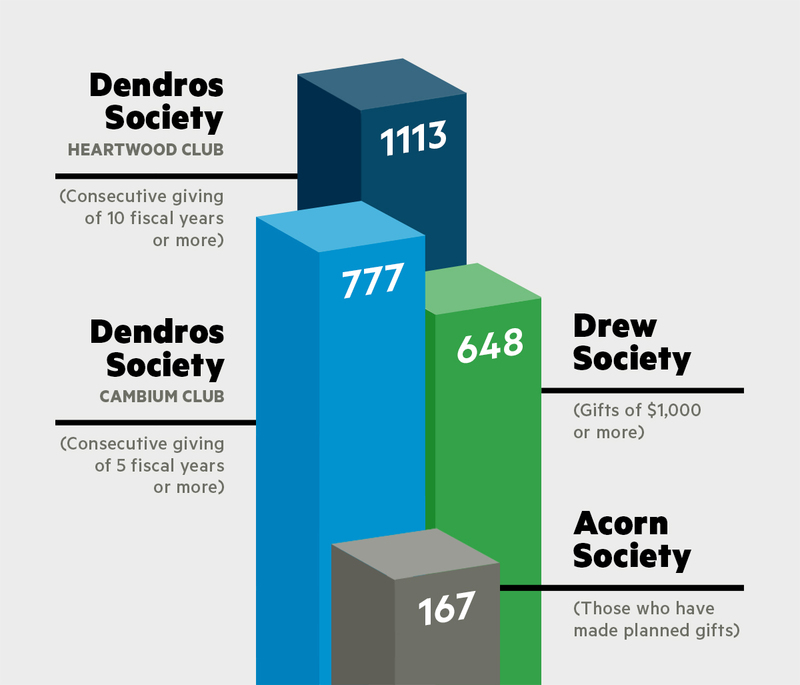 For more information about Dendros Society, please contact Kaitlin Casey, interim director of Annual Giving, at kcasey1@drew.edu or 973-408-3039. The Senior Gift Society recognizes those who make a donation to the University in their senior year to support future generations of Drew students. Since 1983, the Senior Gift Society has enabled graduating classes to create lasting legacies and at the same time enhance the student experience at Drew. Learn more about the Senior Gift Society. As part of a longstanding tradition, the Drew Theological School Class of 2018 made a “Senior” Gift to benefit the Theological School community. This year, funds were directed to the Theological School Annual Scholarship Fund, which benefits future generations of Theo students and honors the Rev. Dr. Karen Oliveto C’80, G’91,’02, United Methodist Bishop, and Dr. Jesse Mann, Drew Theological Librarian—as selected by the graduating class. It’s not too late to make a gift online. Prefer to write a check or make a pledge? View and dowload the 2018 Theo giving form. Questions? Contact Hope Coppinger at hcoppinger@drew.edu. "Every time I give to Drew I am reminded of how blessed my life is because of this place. Every dollar I give creates new possibilities."